Which Wines are Best for This Year’s Backyard BBQ? Beer and barbecue, barbecue and beer, they have been lifetime companions for many years. But beer is not a one size fits all solution and sometimes all someone really needs is a good glass of wine. Beer has been combined with BBQ over the years due to its ability to cleanse the palate. The acidic coldness of beer works to scrap off the rich fat that comes from meat. 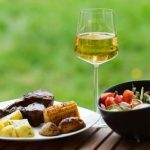 However, there are several wines that have the same effect as beer and also create a perfect combination with BBQ. Grilling is a great way to cook food in the summer, but some foods tend to be a little more intimidating than others. 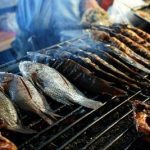 Fish falls into this delicate category, because it falls apart easily, making it difficult to move around on the grill. Fish can also be difficult to tell when it’s done, and it only takes a little bit of time to overcook and burn a fillet. Here are some tips to help attain a perfectly grilled fish. Summer is the season for pool parties, lazy days at the lake, and family barbecues. The long cold days of winter have given way to warm sunshine and the smell of hamburgers and hotdogs on the grill. Unfortunately, many traditional cookouts feature foods loaded with extra calories and fat. With a few simple tips, you can pile on the flavor and not the pounds at your next barbecue. The foundation for a healthier cookout menu is a good lean protein. Chicken, turkey, pork, and fish can provide a lighter alternative to traditional ground beef. If you aren’t ready to stray from the ground beef, try switching to a leaner cut such as sirloin. If you choose to use a leaner cut of meat, try adding some finely chopped veggies such as onions, peppers, or mushrooms, into the mixture. The vegetables keep the meat moist and boost the flavor.